What to Do With These Tickets? when I don’t keep one of these anymore? I used to be such a faithful journal writer. Now, I blog. I still keep a journal of sorts — I write down snippets and ideas of things I want to blog about. But when I look back at these entries, they don’t tell a story. I have to read my blog to get the whole story, which requires a computer and internet access. As I was flipping through my journals tonight, I found not only tickets to plays and movies, but cards from bouquets of flowers I received from Ed, little notes from a friend, and special emails I printed to stick into the pages of my journal. I love those little artifacts, these little scraps of memories. See the pinkish ticket in the journal above? I wrote in that journal that I had gone to see my mom sing in the chorus of a local production of Don Giovanni. I had completely forgotten she was in that opera. I remember going with Mom to auditions to give her support, attending the concerts she sang in, and listening to her sing in church. I can remember exactly how she sounded when she sang a solo at the late service every year on Christmas Eve. But I had forgotten about Don Giovanni. I think these tickets are a sign…a sign that I need to continue my last journal where I left off, to write down with pen and paper little events like these. Little events that may not seem that important right now, but might mean the world to me in years to come. Little events, like hearing my mom sing ten years ago, in a little opera house in the Midwest. 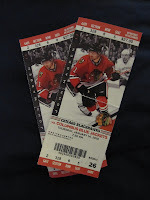 11 Responses to What to Do With These Tickets? I found a notebook from 2008 I kept of to do lists, grocery lists, random thought lists, doodles, home project ideas and clippings. Even though it wasn't a proper journal, it was like a time capsule. I've never been an avid journal keeper but I think now that we're all bloggers, it's the new "in" way of keeping one. At least I hope so. Now I just need to tone down my potty mouth and say some memorable things.On the other hand, it's nice to remember things and see the proof that you were there. Two things:My best friend from childhood passed away over fifteen years ago. She was a journal keeper from the time she was eleven. Her bookcase bottom shelf told her life story in a series of notebooks that held the story and tickets, coupons, dried flowers, programs, anything that made a particular event a memory. And, of course, journal pages of her everyday life. (She would have loved — heck, I think she invented it — scrapbooking) This has become the most prized possession of her daughters and grandchildren. Momma's never left. If you really have to choose between blogging and keeping a journal, pick the journal — you can always return to blogging when you're less busy but you'll never recall the immediacy of journaling your life's moments that you don't particularly want the world to know. Just think about it.2. If you really can't get offline and journal privately, there are several companies out there, now, (some can easily be found through Blogger) that will print your entire year's worth of blogs for around $40 in a bound book. That's a very reasonable price for your blogging memoirs. If you save a dollar a week, you can print your blog annually! It includes the whole thing, including pictures (not sidebars) you've uploaded.Just a thought.P.S. Please accept my sincerest sympathy for all that you've been going through, lately. I've lost both a husband and daughter to cancer, and three beloved relatives just this past Christmas. It's not easy but know that my prayers are with you. I haven't ever done a good job keeping a journal or scrapbooking. It would be wonderful to have a record of all of that but I've never been organized enough to do it. I used to be such a faithful journal writer. Until I had kids. Now, I am so sporadic (at best). I want to get started again, and finally realized that I just need to start now and not worry about catching up on the last couple years. That is just too overwhelming. So perhaps I need to set some time aside every day. I think it is really important to record our thoughts and daily lives. I've tried to keep a journal but right now I have to focus on my blog, with the little time I have for myself I can't do both!Big Hugs and Happy Saturday!!! ;)Paloma. I kept a 'common' journal for a few years, inviting others to write in it as well. And then I threw it out. And now I really regret throwing it out!Blogging is similar in a way, so that's good, but writing down your innermost thoughts and feelings where the whole world and their aunt is able to read it, mightn't be the best option! Sounds like a nice plan. I always try to journal but never seem to follow through. Have a wonderful weekend. I've done similar things with past journals and then I started blogging and didn't write them as much either. I would tape things in there, like photos, draw things, etc. Boy, they are full of a lot of memories for me. I'll have to get back into it too. Oh, what a precious find! I too struggle with the journaling vs. blogging vs. scrapbooking dilemma. I guess for now, I do the best I can! I keep a journal as well and for some reason, I've not been doing it daily. It is on my goal list to daily journal. I'm getting better with it since I am more aware of it. I don't keep it as detailed as you do, mostly a food journal/to-do and goal list with a gratitude statement or thoughts. I did find that when I got a cute notebook, I was more consistent with it. Stopping by from SITS!